A great stamp for helping keep track of those who have paid for entry. Simply stamp the back of the hand and guests can re enter by just showing their hand. If you would like custom text instead the flag such as Club or Bar name, then please email us after checkout with your requirements - we will custom make this at no extra charge. 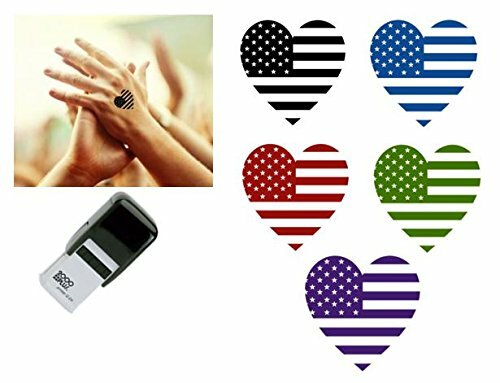 STARS & STRIPES HEART FLAG hand stamp - suitable for Festivals, Parties, Pubs, Special Events - Exhibitions self inking 7/8" x 7/8"
If you have any questions about this product by Handy Stamps, contact us by completing and submitting the form below. If you are looking for a specif part number, please include it with your message.